Tourmaline has been found throughout history in Africa, the Ural Mountains and other European locations, but some of the most exciting finds have been established in North and South America. 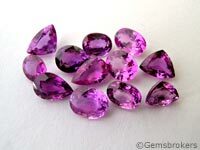 Gem quality stones were discovered early in the 19th century in the United States at Mount Mica near Paris, Maine. In 1972, the Dutton Mine in Newry, Maine established itself as one of the largest finds on record ever, and for a brief period of time became a world-source of superior quality red and green tourmaline. In the 1860's, the first expeditions looking for gem and mineral resources into California’s Riverside and San Diego Counties led to the discovery of pink tourmaline in the San Diego County. This discovery coincided with the reign of this gem’s greatest enthusiast in history: Most of the pink tourmaline that was mined at the Stewart Mine went to the Empress Tzu Hsi of the Ch'ing Dynasty and her entourage, who purchased everything they could get and had it exported to China. The California tourmaline boom ended in 1911 after the death of the Dowager Empress. World War I marked an end to mining in the San Diego area until the seventies. After the Second World War, German immigration was strong in the Minas Gerais State of Brazil where the largest, gem-quality tourmaline mines have been discovered. These immigrants had close ties to Idar-Oberstein, a small German city that thus became the main cutting center for the output of the Cruzeiro, Golconda, Virgem da Lapa and Itatiaia (Jonas) mines. Another notable find occured in the eighties, near the small village Sao Jose de Batalha in the state of Paraiba, Brazil, and yielded some new electric blue colors. A rare type of tourmaline from Tanzania, called chrome tourmaline which occurs in a very rich green color caused by chromium, which is also the main coloring agent of emerald, is another particularly beautiful variety. 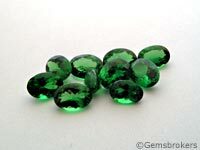 Tourmaline is also mined in Kenya, Madagascar, Nigeria, Mozambique, Myanmar, Russia, Namibia, Afghanistan, Pakistan and Sri Lanka.